The Wednesday Wandering is short. The picture is really cute, though. Take a look. Then fill your mug with something warm, before you join me and Alan as he straightens me out as to what Boxing Day really is. ALAN: Actually, we use both phrasings, so really you can’t go wrong however you say it. I hope you and Jim had an equally Merry/Happy Christmas. JANE: We did. We still are, actually… We don’t give up on Christmas easily. I believe today is what you call Boxing Day. I remember being completely confused about this term when as a kid I first came across it in fiction set in England. I couldn’t figure out why the day after Christmas would be devoted to a sport in which large, mostly naked men beat on each other. Then someone told me that Boxing Day had to do with undecorating. That makes more sense. ALAN: Undecorating? That’s a lovely neologism, but I’m a bit confused as to what you mean by it. JANE: You know, taking down all the Christmas decorations and putting them away in boxes until next year. ALAN: Oh no! Not at all! It’s terribly bad luck to take the decorations down so early. You aren’t allowed to take them down until Twelfth Night. It’s also terribly bad luck to take them down after Twelfth Night as well, so you really have a rather narrow window of opportunity to get it right. I quickly lose count and I’m never very sure when Twelfth Night actually is. Perhaps I’m doomed to a lifetime of bad luck. JANE: You make me feel good. Jim and I like leaving our decorations up until at least Twelfth Night. We go through so much work to put them up, it seems a shame to rush to take them down. Twelfth Night, in case you want to put it on your calendar, is January 6. Still, despite your ignorance of this particular date, you seem to have had quite a lucky life. JANE: You are being silly again – and Shakespeare would have loved it. January 6, in addition to being Twelfth Night, is also the “Feast of Fools,” basically, a time when anything goes. I suspect that’s what Shakespeare was referring to in his subtitle. By the by, I can’t resist mentioning, the very first Wednesday Wandering (1-20-10) was about attending a performance of the play. Now, you’ve told me what Boxing Day isn’t. How about telling me what it actually is? ALAN: I suspect the name and the practice may well date back to feudal times and perhaps even earlier. On Boxing Day, the Lord of the Manor would traditionally reward the peasants for a year of hard work by giving them Christmas Boxes, or presents. 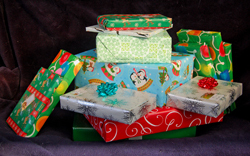 Certainly in the eighteenth, nineteenth, and twentieth centuries members of the aristocracy would give Christmas Boxes to their servants. The tradition was very widespread and percolated down through the ranks. My father always made a point of leaving a Christmas Box (that was the phrase he used) for the postman, the milkman and the binman. Rumour had it that if you didn’t give them a Christmas Box they’d take their revenge on you. Letters would be lost in the mail, the milk would be sour and rubbish would accidentally spill all over your front yard. JANE: Did that really happen? ALAN: No, not really. They’d all have lost their jobs if they did that sort of thing. But it makes a nice story. I think the practice may have died out with my father’s generation though. Certainly I’ve never left Christmas Boxes and none of my friends indulge in the practice. Mind you, mail deliveries are being reduced to only three days a week, you simply can’t get milk delivered to your house anymore, and all that the binmen do these days is sit in their great big roaring truck and press buttons. The truck does all the hard work of picking up the bins and tossing the rubbish into itself. I can’t help wondering if there’s a connection between the lack of Christmas Boxes and the reduction in service. JANE: Interesting thought. I would have thought gift giving would wait for Twelfth Night, since that is also the Feast of the Epiphany, which celebrates when the Magi gave gifts to the Christ Child. ALAN: So tell me, since you don’t seem to have the concept of Boxing Day, what exactly do you do on the day after Christmas? JANE: Sleep. Eat leftovers. Revel in having time off to relax with friends and loved ones. This year my mom is here and I’ve been enjoying her company. ALAN: Oh yes – we do that as well. And Boxing Day is also a public holiday, just like Christmas Day. But the poor old shopkeepers don’t get time off. Boxing Day is when the big after Christmas sales start, and every shop in the country is packed with people hunting down bargains. I suppose it’s the equivalent of your Black Friday. JANE: Black Friday is similar, but not the same. We also have big after Christmas sales. Black Friday starts the holiday shopping frenzy. It’s the day after American Thanksgiving, which is always held on a Thursday. Since many people take the Friday off from work, it became a day to go out and start the holiday shopping. There is no set agreement as to the origin of the term. I’ve heard that retailers originated it because that would be the day they could be sure to be “in the black” for the year’s sales. I’ve also heard it was originated by police officers somewhere in, I think, Pennsylvania, because of the traffic tangles and other problems that originated when everyone went shopping at once. ALAN: You mentioned earlier on that Twelfth Night is also called the Feast of Fools. But actually Boxing Day is also, somewhat foolishly, a role-reversal day in addition to all its other virtues. On Christmas Day the household servants would have been rushed off their feet looking after all the guests. So on Boxing Day they were allowed a day of rest and the lords and ladies would look after them, serving them food and drink. I believe that still happens in the army – the officers all act as servants to the other ranks on Boxing Day. We used to do it at school as well – on the last day of term before the Christmas holidays, the senior boys would serve lunch to the juniors. Seems to me that Boxing Day is simply Saturnalia moved a little later on the calendar probably because the dates earlier in December became associated with the Christian feast of Christmas. ALAN: Oh that sounds like fun. Feasting, license and misrule. Let’s go with that! JANE: In the U.S., we don’t have a formal feast of misrule associated with Christmas time, but there are those who feel it is a time to give gifts to those in the service industry in the form of tips to hairdressers, letter carriers, and the like. So, I suppose the Christmas Box is alive and well here, if not there. ALAN: Tipping. I don’t understand tipping. We never do it, which really makes life so much simpler and prevents embarrassment. JANE: Tipping customs confuse me, too, but I can at least try to explain. However, let’s save that for next time. This entry was posted on December 26, 2013 at 1:00 am and is filed under Random Wanderings. You can follow any responses to this entry through the RSS 2.0 feed. You can leave a response, or trackback from your own site. Now I understand why Shakespeare titled one of my favorites of his comedies “Twelfth Night.” Thanks! Well, happy Boxing Day to all the world! Today is also St. Stephen’s Day, on which, in parts of the British Isles, it was traditional to hunt down and kill a wren. The wren was then taken from house to house, with songs and rhymes, and the hunters were given gifts of coins. While I’m not going to kill a wren, I may go down to the river with my binoculars and see how many I can find this afternoon. It wouldn’t surprise me if this custom and the one Allan describes are intertwined, so both explanations, ultimately, are correct. Interestingly, the custom of collecting alms, for the Church, while singing in the street on St Stephen’s day is – or was – apparently quite widespread in northern Europe. If you want a great use of the Hunting of the Wren in fiction, I highly recommend Susan Cooper’s novel _The Dark Is Rising_. Utterly wonderful. Great album… Only one I know with a song that includes an entire recipe. The Feast of the Epiphany, or “Three King’s Day” is very big in Spanish culture. Mom was over there one year, and was stuck on the roads for many extra hours coming back from Morrocco by each little town’s celebrations.